We had an earthquake here yesterday, which I compare to the California quakes I have felt. Yesterday we had a 5.8 earthquake in central Virginia, near Louisa and Mineral, about 40 miles away. I felt it strongly here in Mechanicsville, and ran out of the house. The earthquake felt like a long rumble of thunder, or standing near the railroad tracks as a fast train goes by. The house shook for about 15 seconds, with a steady vibration or buzz, rather than a jolt or sway. At first I thought someone was opening our overhead garage door, then I wondered if a truck had hit our house, and finally I realized, oh, an earthquake! I got up from my chair and zoomed out the front door. I experienced three or four big earthquakes when I lived in California, including Loma Prieta 1989 during the World Series and the big Landers 1992 quakes, and I can tell you that this one felt much different. In the California earthquakes, the ground moved back and forth laterally, in a series of rolling waves that made it difficult to remain standing on your feet, like trying to stand up in a small rowboat or canoe. This quake in central Virginia was different, more like a long constant buzz or rumble, a vibration in all directions, without the feeling of rolling waves of movement. This quake felt like the earth had become one of those Electric Football toys of the 60s and 70s, where the metal field vibrated to move the little football players around. Commenters from around the world have joked about the “over-reaction” of people on the East Coast to such a small earthquake, in which no buildings collapsed and there was little damage. Except in Mineral and Louisa, nothing fell off shelves and no dishes were broken. It is true that in terms of ground motion, I’ve felt much larger quakes. But it must be kept in mind that earthquakes are rare here, and this was the “quake baptism” for many people. Also, mid-plate earthquakes are felt much more widely, as the tectonic plate vibrates over a wider area, rather than the grinding and gnashing of tectonic plates at their crumbled edges, as in California and Japan. Plus, as I explained above, this quake felt different. But, yes, there has been some over-reaction, too. 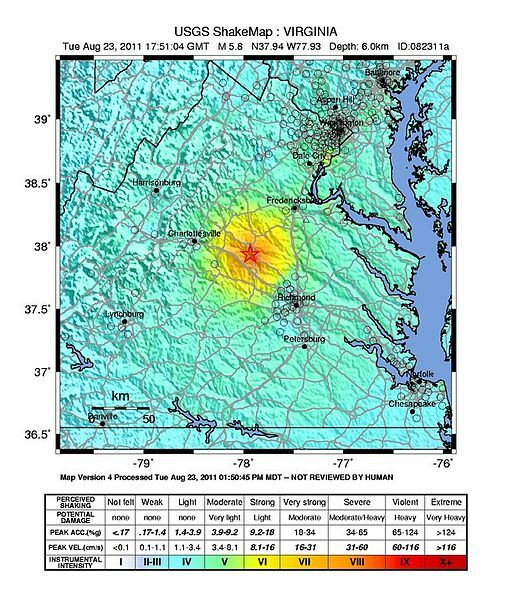 Below is the USGS Shake Map for the 5.8 Louisa, Virginia quake. The quake’s seismographic measurements were stronger to the northeast of the epicenter. 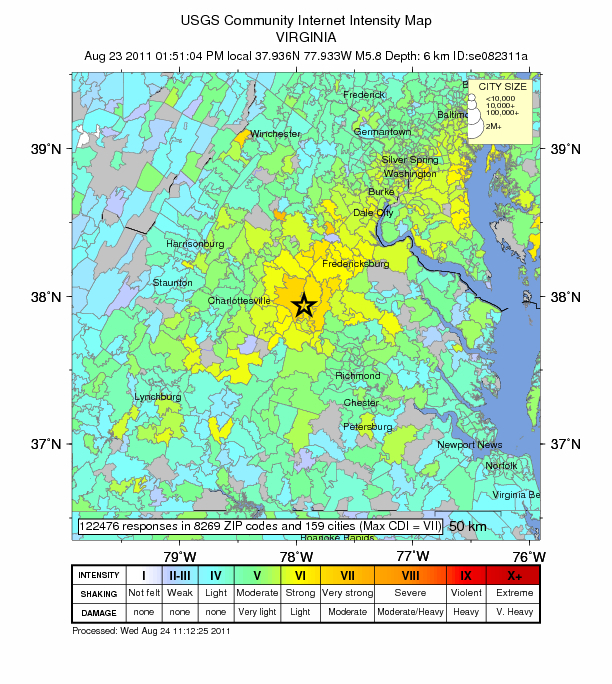 The shaking near Richmond was less, measured in the 4 to 4.5 range. 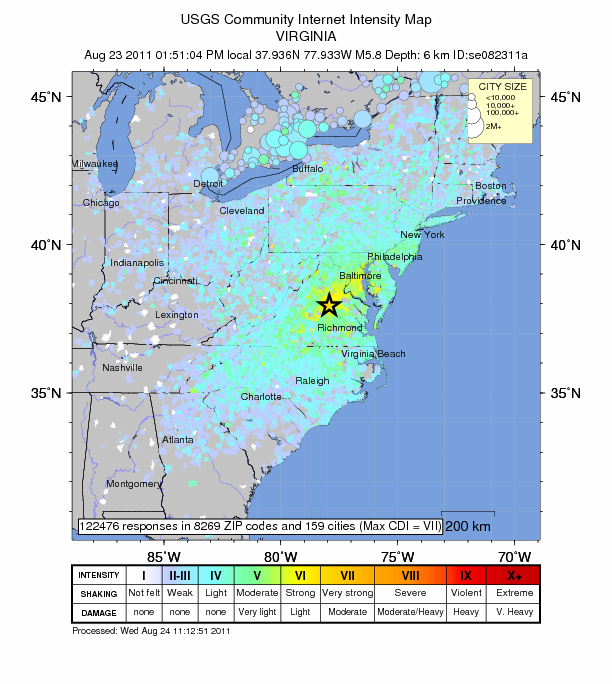 Here is a link to the Times-Dispatch article on the quake, 5.8-magnitude quake shakes central Virginia, East Coast. 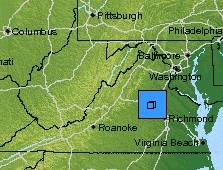 Here is the Wikipedia page: 2011 Virginia earthquake. There have been four significant aftershocks, (though all unfelt by me), making this a series of five quakes (so far). I felt this one, a small rumble, which shook the house for about 5 seconds. I made a Google Map tracking the quake and its aftershocks. Click the pointers to see which temblor is which.